Sometimes it can feel like you can't take a step without bumping into a gaggle of first-person shooters, but People Can Fly's creative director Adrian Chmielarz says that that's just your mind playing tricks on you. There's no such thing as too much of a good thing, not when it comes to FPS's anyway. 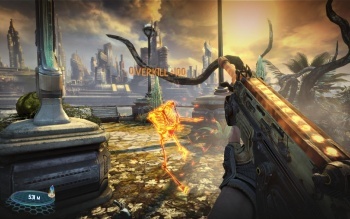 Chmielarz, whose studio is currently working on ultra-violent, tongue-in-cheek shooter Bulletstorm, says that the idea that the market is saturated with shooters is a myth. Chmielarz thought that genre saturation was something that only seemed to be an issue with videogames, and that no one complains when an author writes a new detective novel, or another action movie hits theaters. He said that while it may seem like there were a lot of shooters on the horizon, if you looked at the actual month-to-month release schedule, there was absolutely no danger of being overrun. Chmielarz was actually disappointed that there weren't more FPS games coming out, as he would happily play a "great shooter" every couple of weeks, but that there weren't enough to let him do it. While Chmielarz has undeniable enthusiasm for the genre, an FPS developer, who, by his own admission, would play a lot more shooters if he could, is perhaps not the most objective person to ask about market saturation. Still, when games like Halo: Reach make a couple of hundred million in their first day, it's going to be a while before the genre fizzles out. Bulletstorm will be released for Xbox 360, PC and PS3 on February 22nd.